CARBON LEAF: THE INNOVATIVE CARBON FIBER ARMCHAIR! 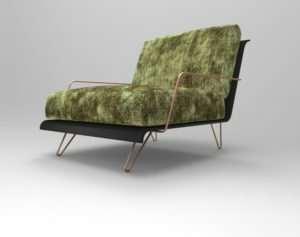 Carbon Leaf, the revolutionary carbon fiber armchair, manufactured by EPI for DELTA SALOTTI, was presented in recent days at Salone del Mobile di Milano 2018. Aerospace technology and avant-garde design meet for give birth to a unique object that seems to float in the air! Carbon fiber and furniture, two worlds apparently so far apart, intertwine in the name of innovation and technology. Two Apulian company, united by the desire to renew themselves and by the curiosity towards the materials of the future. On the one hand, EPI, a company based in Brindisi, specialized in the design and production of carbon fiber components and composite materials for various sectors; on the other hand DELTA SALOTTI, located in the heart of the Murgia district of the upholstered furniture, Santeramo in Colle, which produces quality seats and sofas, able to challenge time and fashions. Common keyword: MADE IN ITALY! From the meeting between two highly innovative companies, attentive to design and quality made in Italy, Carbon Leaf is born, a seat that breaks the classic patterns furniture sector and brings a material still unknown, such as carbon fiber, in daily life! 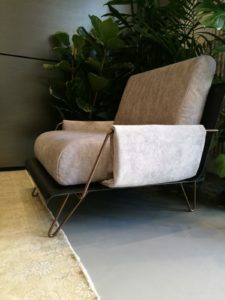 Carbon Leaf carbon fiber armchair, made by EPI for DELTA SALOTTI, has been designed to obtain high lightness, solidity and aesthetic balance thanks to the use of a 5 mm thick carbon fiber sheet, highly resistant to the various stresses . The result is a unique object that seems to float in the air and which supports the wide cushions made with ecological waterlily padding. In addition to its aesthetic features and distinctive design, the aim of this project is to lighten the product while improving its mechanical and aesthetic characteristics. A lightness that translates into greater ease of use and handling both in the warehouse and at home. The technology used for this project comes from research in the aerospace field that EPI has been conducting for years in collaboration with specialized research centers, studying the application of composite materials to commonly used objects but with high performance. 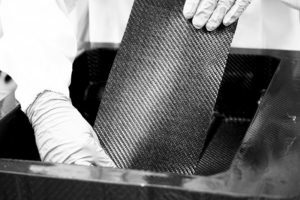 CARBON FIBER is distringuished both by its excellent mechanical properties, such as the strength-to-weight ratio and its aesthetics. 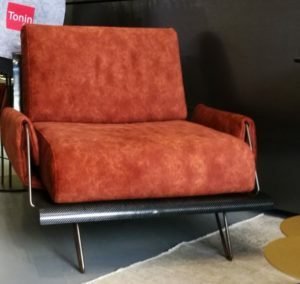 Applied to furniture-design, this material with exceptional performance, allows you to renew existing products or create new ones, with unique features! 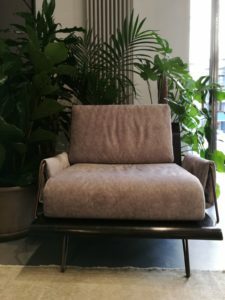 The manufacturing process of Carbon Leaf carbon fiber chair, starts from a careful stylistic and engineering research developed by the two companies, to better combine the aesthetic requirements with the technical feasibility of the project. 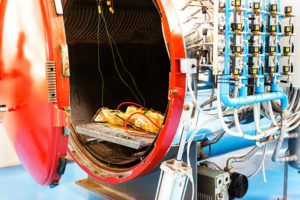 The processing of the carbon fiber structure takes place through a manual lamination process, combined with the use of industrial autoclaves; this aeronautical technology ensures the highest quality standards and a great mechanical resistance. The carbon fiber armchair is completed by the highest quality lining and the great craftsmanship experience, which has always been the pillars of DELTA SALOTTI. State-of-the-art technology and craftsmanship come together and act as a link between the two companies, which find a fundamental common ground in the quality of materials and made in Italy manufacturing, giving an excellent example of cooperation between two companies highly specialized in their field , but with the will to open up to new production challenges! ULTRACERAMICA – People and the Object of the Future! SPOGA HORSE and ILM OFFENBACH 2018: the unmissible trade fairs of September.